Oh time flies, doesn’t it? I love how you tell me that you would like to sleep in the bedroom and how you snuggle under the covers as I watch movies. I love how you seem to understand so much of what I say even though you don’t agree with much of it. I love how crazy you are about agility even though I often don’t dare to run fast because I know you would run even faster and I’m afraid you wouldn’t be able to handle your body over obstacles. I still get an adrenaline rush every time I run with you. I love how you lure Java away with a toy so that you can have a few moments alone with me. I love how you keep checking on me during walks. You are perfect in so many ways. ❤ Please stay sound and happy! Oooo, I’d love to run a whole Euro-style course!! Though I’d have to brush up on my Slovenian. 😉 when I have some more money I’d love to try and make it onto the Aussie WAO team… and maybe afterwards drop by Slovenia again (depending on where it’s being held that year, haha). 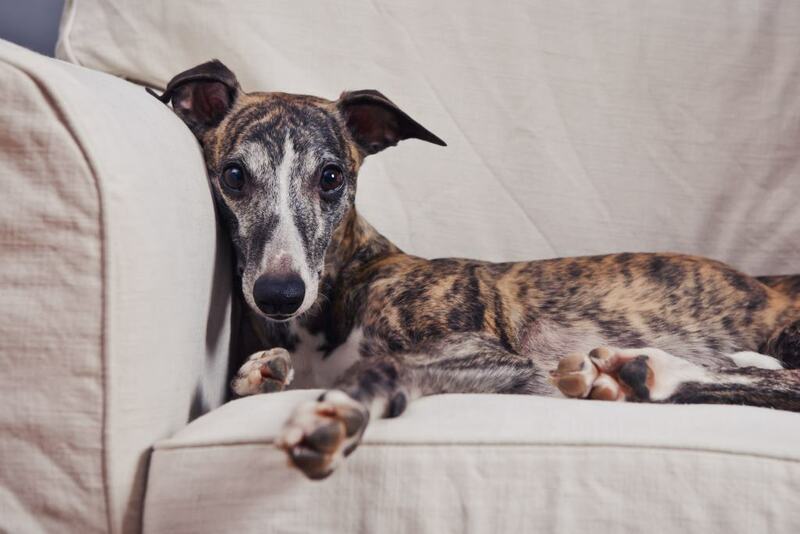 And he IS a tiger-whippet! Look at his stripes. Ooo, I know lots of those already! Cik/cap obviously, tunnel I know from Silvia, and slalom because we all think it sounds so much prettier when you say “SLALOM SLALOM” than “WEAVE WEAVE! !” and less angry… and Okrog because I did that with Ruby already. For some reason I was sure that I was going to screw up Ruby’s weaves so I thought it was super-smart to call it “weave” so I could save “slalom” for when I’m ready to get it right. Well, “weave” turned out just fine, but then I was stuck using a different cue from everyone else and sometimes I found myself saying “slalom” on course just because I heard it so often from others. So when Java came I decided to call it “slalom”. I think Ruby would weave just fine on both cues. As for smashing my dog there is a little secret… the more European-y the course, the slower the dog, the safer it is for him. So we’ll make a super twisty course and it will be fine 🙂 I’m just freaking out these days because I’m trying to run A1 stuff with him… I wish I could buy him a full-body armor for his birthday! I forgot to say to your other reply that I don’t think Lu actually needs to run fast for me to get on the team- she wouldn’t be coming with me, Aussies always use borrowed dogs from the host country. I watched a video of this years team just running some courses and Their dogs weren’t blitzingly fast.